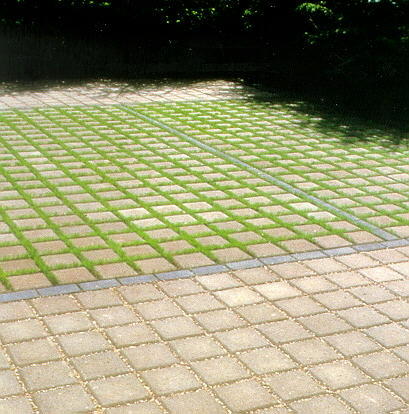 The surface of choice for driveways, patios, pool decks, and walkways has been changing quietly. What once might have been pounded dirt or gravel shifted first to concrete or blacktop, to brick for older high-end houses in some parts of the country, and sometimes even outdoor tile for pedestrian walkways. Now pavers and concrete imprinting are increasing in popularity. Neither system is new. Concrete paver systems existed in World War II Europe, and the oldest and best-known of the architectural imprinted concrete systems, Bomanite, was invented in the mid-1950s by Brad Bowman of Carmel, California. Before World II, German engineers developed some of the early paver technology. After the war, in the 1950s and 1960s, Dutch and German engineers improved on that technology out of necessity. "Pavers were used to replace clay units destroyed by World War II bombs," says Tony Iacocca, general manager for the Pavers and Walls Division of Lafarge Construction Materials in Milton, Ontario, Canada, a division of Lafarge Corporation North America in Herndon, Virginia, which in turn is 52 percent owned by Lafarge, S.A.of Paris, France. "Its hard for us today to conceive of what Europe look like after World War II," says David R. Smith, technology director of the Interlocking Concrete Pavement Institute (ICPI) in Washington D.C. "In 1984, I saw the last bomb site to be rebuilt. It was a vacant lot." "Flexible pavers do well in cold weather because freezing and thawing conditions do not affect their basic structural integrity," says Iacocca. "Asphalt and concrete will crack or spall. Pavers, imprinted concrete, and regular pavement all have problems when the base is poorly designed and without sufficient strength." In the early 1970s, Canadian companies received the first paver technology exported to North America. "Unilock (KNR Concrete) in Toronto was the first North American company to make pavers," says Smith. "In the late 1970s, German paver manufacturer Alfons Schmidt established Florida's first paver company, then known as Paver Systems, in West Palm Beach. Schmidt's company, now known as Paver Systems by Tarmac, has paver plants today in Orlando, Tampa, and West Palm Beach." By the late 1980s, Canadians and others familiar with paver technology established several of the early U.S. paver manufacturing companies. "Pavers are a heavy, weight-sensitive concrete product," says Smith. "Pavers are only shipped so far before the freight cost exceeds the price of the product. Most manufacturers only ship about 100 miles from their manufacturing site. Sometimes architects want a particular shape or color and are willing to pay the shipping expense." As interest in pavers grew, local paver manufacturing companies spread across the United States. In the late 1980s and early 1990s, seven Florida paver manufacturers contributed about 60 percent of the total pavers manufactured  about 25 million square feet. Today they contribute 60 million square feet, but now its only 20 percent of the national total. "In 1992, 110 square million feet of paving stones were sold in the United States. Seven years later, in 1999, 310 million square feet of paving stones were sold here," says Smith. "Since 1981, over three billion square feet of paving stones have been installed across North America." "Today Florida consumes about three square feet of pavers per resident per year, the whole United States uses about 1.2 square feet per person of pavers per year, The Netherlands uses 11 square feet per person and Germany leads with 22 square feet of pavers per person per year," says Iacocca. "For United States citizens, pavers are a status symbol, a high-profile welcome mat, a way of saying who you are and how your house and grounds are different from those of your neighbors. They are a low-key way to tie your house and driveway together architecturally to form a welcome mat. They give homeowners a sense of place." From a cost standpoint, gray concrete and asphalt are the cheapest surface covers. 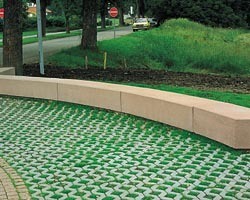 Interlocking pavers and imprinted concrete are medium priced. Aged brick, stone, and tile are the most expensive. When I wrote my first paver story in the early 1990s for a California paper, my editor -- who generally was well-informed -- asked me what that strange item was on my story list. Back then, all of California may have had just five paver manufacturers; today it has 10. I suggested that she drive around and watch for workmen tearing out and replacing a seemingly functional concrete or asphalt surface with what appeared to be aged brick, cobblestones, slate, or tile. "If you look closely," I told her, "you'll see that the workmen are installing interlocking pavers that are about the size of normal bricks, or are working with a special mold to imprint a design on colored, cast-in-place architectural concrete." Both of these systems require removal of existing concrete or asphalt and installation of a new base. Pavers as we know them today were invented in The Netherlands to meet high demand for cheap, time-saving construction materials. "At the end of World War II there was not enough coal to bake clay pavers for Dutch streets," says Smith. Beginning in 1950, pavers were made from concrete out of necessity. In the early 1960s, the Dutch refined and improved their technology, which was exported in the 1970s to Canada and in the 1980s to the United States. 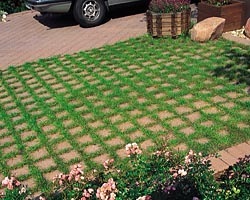 Pavers can cost $2 to $3 a square foot, or more. Smith says an average patio project should cost $5 to $10 a square foot to install, depending on the size of the pavers used, the area to be covered, and the accessibility of the area. A driveway should cost $6 to $8 a square foot. "Some of our members have small palettes of 15 colors while others offer over a hundred colors," Smith says. "Some paver companies will manufacture custom-colored pavers depending on the job size, the color requested, and the consumer's willingness to pay the price." Special-order colors can be mixed from a sample as small as a paint chip. Color preferences differ regionally, and many property-owners like to color-coordinate their pavers with their buildings. Light colors, including beiges, pinks, and mauves, are popular for Florida pool decks and sidewalks. So is red brick in the northeast; it can be laid in dozens of interlocking patterns. "Also popular in the mid-Atlantic and northeast are color blends," says Smith. "Browns and reds are popular in the southwest." Many homeowners want the traditional herringbone style with bricks at 90-degree and 45-degree angles. One manufacturer, Tremron Miami, Inc., offers 21 basic paving-stone shapes (brick, cobblestone, diamond, dogbone, guitar, octagon, and 4X4, 4X8, 8X8, and 12X12 squares) in about 300 different colors. "We use 4X8 in all the popular patterns, including basketweave, herringbone, running bond, and parquet," says Edward B. Pacitti, general manager of Tremron Miami." Concrete pavers are made from a combination of sand and cement, under heavy vibration. Temron uses a system in which each paver is made in a mold, then stacked 10 layers high to dry. Unlike traditional bricks, pavers are not baked in kilns. Interlocking pavers are designed to be installed on four to eight inches of compacted aggregate base topped by an inch of level concrete sand. The pavers are laid, compacted joint sand is brushed between them, and again they are compacted or tamped down tightly. 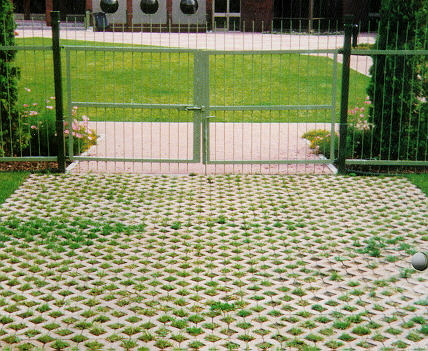 They have to be constrained by a border of aluminum, concrete, or plastic edging to keep them from spreading. Pavers come in three thicknesses  the standard, which is 2 3/8-inches (60 mm) thick, for pedestrian areas and driveways; a thinner paver 7/8 of an inch to one inch thick for overlays on existing concrete; and a 3 1/8-inch (80mm) paver used for heavy-duty applications on roads. The key to proper installation, however, is not only how thick the pavers are but how well the base is compacted. Thicker bases are required on driveways than for walkways and patios. The thinner pavers can be used over existing Chattahoochee stone or concrete pavement. They can be installed by spreading half an inch of sand over the Chattahoochee or concrete. Then uncompacted pavers are placed, and paving sand is swept and hosed between the paver joints. Thin pavers save the homeowner the cost of removing the Chattahoochee or concrete. All paving stones are required to meet or exceed a national compressive-strength standard of 8,000 pounds per square inch, and standards for absorption of water (typically less than five percent) and resistance to freezing, thawing, and abrasion. Before you buy or install pavers, check with your local zoning board. Paver installation regulations differ from community to community. Homeowners can install their own patio pavers, but dont try to install a deck or driveway without some professional construction skills. Do-it-yourselfers should use the Interlocking Concrete Pavement Institutes Web site for a list of member paver manufacturers, online free Adobe-formatted publications, and the names of ICPI-certified member contractors. Manufacturers sell through dealers, masonry-supply stores, and retail home centers. "Paver trends are toward larger-size pavers, including 12-by-12 inch-square pavers that look like stone with various finishes," says Smith. "European technology will make that happen. Paver manufacturers continue to look to Europe and now Japan for technological and design advancements." Consumers will try and almost nearly succeed in duplicating a design in a picture they see, or a design they encounter on a visit to Europe or Asia. "Tumbled pavers are popular right now," Iacocca says. "The tumbling process makes our product resemble aged, weathered stone. Our industry is driven by popular tastes and desires that are also seen in furniture and design. Right now old-looking is in. The current trend should last for the next three to five years." "New pavers are placed in a large tumbler to knock off their edges and make them look like cobblestones," says Smith. "It's a very nice effect. Companies making tumbled pavers just can't keep up with demand. Look at our Web site for local manufacturers and look to see if they are making tumbled product. Most are." "Technologically, we're five to seven years behind Europe," says Iacocca. "The future, I think, will be in replication of natural stones with special aggregates, including granite, quartz, and silicates. This is reflected in colors of black, green, pink, white, and some yellows already being used in Europe. Computers and faster communications are allowing North Americans to tap into European technological developments. Some of the technology is licensed and exported by the equipment suppliers. They let us know what's available. Surprisingly, the basic equipment withstands about 10 years of product changes before it needs to be replaced." New in Europe are drainage pavers that allow infiltration of storm water through the pavers and percolation down through the ground, reducing the amount of storm water that is sent through storm-sewer systems. 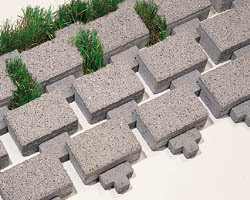 "Permeable or drainage pavements come in colors, can be tumbled or stylish, and can be used in patterns," Iacocca says. Kronimus AG, a Franco-German company, is one of several developing these pavés écologiques. Kronimus developed five pavés écologiques styles, all of which are explained in easy-to-follow French with lots of graphics on the firms Web site. Iacocca also is impressed by the literature and developments of two other companies, Karl Ebert GmbH and Zapf KG. Neither has a Web site. Bomanite Corporation, founded in 1970 by Brad Bowman, is a manufacturer of architectural concrete-imprinting equipment and has a network of trained and licensed contractors in more than 70 countries. Since 1970, more than 100 million square feet of Bomanite designs have been installed around the world. Bomanite designs come in more than 100 modular polyurethane shapes, sometimes called cookie-cutter shapes, and 25 standard colors. Bowmanite's licensed contractors can order custom colors and shapes from the firm. The smallest Bomanite mold is five by five feet; the largest is six by nine feet. The imprinting cost includes all preparations  rough grading; set-up and installation of four to six inches of concrete, depending on load-bearing requirements; the cost of the concrete; concrete color hardening; imprinting of the concrete; and a concrete cure or sealer coat. A job's cost depends on a variety of variables, including ease of job access, color, layout design, and the shape of the mold. Blue concrete colors are the most expensive. Color hardener is added to plastic concrete by the dry shake method. Color is dusted on top of the concrete and floated, or bulled with a large, coarse trowel, and mixed and worked into the concrete. Next the workman applies a special imprinting tool to the concrete to create the desired surface pattern and texture. A concrete cure or sealer coat is added later. Several cure and sealer products are on the market. Ask your contractor to choose the best product for your application. Concrete-curing products are used in drier climates such as Arizona, California, and New Mexico, but sealers work best in humid and moist southern Florida. The sealer is applied a week after the initial installation. It emphasizes the imprint color and helps to protect the surface from staining. 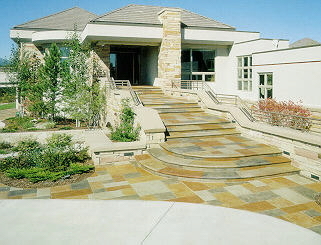 Part of the choice between pavers and imprinted concrete involves maintenance considerations. Imprinted concrete has a bridging quality that allows the surface to remain intact when a subsurface shift occurs. This means workmen can tunnel under imprinted concrete to repair water lines or underground electrical wiring. Pavers have been known to collapse when an irrigation leak occurs under a walkway or driveway. Although manufacturers claim that pavers can be removed when subsurface work is required, and then reinstalled, they may fall apart during reinstallation or be difficult to reinstall. When a portion of an imprinted concrete surface needs repair, the colors can be matched, but the new colors will be more intense. Because pavers are pigmented during manufacture, new pavers of the same color added during a repair job should match those originally installed. A Bomanite surface is easy to clean with any brand of liquid dish detergent, which removes any grease that may collect. Never use a solvent to clean imprinted concrete because it will ruin the sealer. In most instances, dirty imprinted concrete can be cleaned with a garden hose or pressure cleaning with plain water. Apart from being washed down occasionally with water, pavers require little or no maintenance.